The perfectly good explanation the Concord Chamber Music Society’s sold-out performance on Sunday began over 50 years ago (we were there!) at New York’s Town Hall, where a young composer fresh out of Juilliard hove into view in the guise of a musicologist from the University of Southern North Dakota at Hoople, bearing the fruits of his research into the darkest recesses of the Bach family line. Yes, you know the one. Well, that faux musicologist reappeared at Concord Academy this week in the guise of a distinguished elderly composer, bearing the fruits of his long career as the straight man for his 18th-century doppelganger. 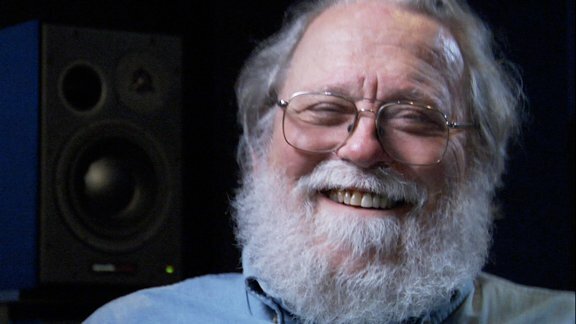 Yes, this was Peter Schickele, in his own right. The BSO players who comprise the CCMS, Director Wendy Putnam (violin), with Clint Foreman, flute, Robert Sheena, oboe, Cathy Basrak, viola, Blaise Déjardin, cello, and Vytas Baksys, piano, together with Schickele as narrator and the provider of what Virgil Thomson used to call “fluid program notes,” essayed a fairly rounded retrospective on the composer’s career—which, though he is 80, he has no intention of considering complete. Since the last time Schickele appeared for such a program, also with CCMS, was in 2008, before BMInt fired up its site, a little general background is warranted for readers of these pages (a wonderfully wide-ranging interview with Schickele in 1988 by Chicago broadcaster Bruce Duffie is here). Schickele is a product of the American Midwest, born in Iowa and raised in North Dakota in a musically-inclined family in the old amateur tradition. After college at Swarthmore, which had no music department to speak of then, he went to Juilliard to study composition with the likes of Roy Harris and Vincent Persichetti. Among his cohort there were composers Leo Brouwer, Philip Glass, Steve Reich, and John Williams; the composition department did not appear at that time to have been a hotbed of avant-gardists, and in that regard Schickele was and is no exception. He aims for directness and simplicity, and for entertainment (his single-word statement of objectives, in answer to an audience question Sunday, is “joy”) in the way that French music, from Saint-Saëns through Françaix, does (curiously, he cites Brahms as the model for his chamber music, though there’s nothing at all Brahmsian about it). He favors wide-open consonances in a manner that often suggests Harris, frequently incorporates American vernacular styles into his “classical” scores, and seems to have an aversion to intricate melodic-harmonic development, to say nothing of gnarly chromaticism or jagged, disjoint pitch values (Schickele’s pitch values almost always coalesce into actual melodies). In short, Schickele is not a neo-tonal composer; he is a paleo-tonal one. It may have helped the development of his personal compositional predilections that the success of PDQ Bach has given Schickele the freedom not to have to teach; the hothouse environment of academic music departments seems to encourage erudite complication for its own sake, as well as for bringing in the prizes and grants that fuel composers’ careers. Schickele has for many years not wanted for commissions, and when he isn’t working on one, or “discovering” new PDQ Bach works (he quipped Sunday that PDQ Bach is the only dead composer who is still accepting commissions, though he hinted that a 15-institution consortium commission for a piano concerto for Jeffrey Biegel, scheduled to premiere this fall, may be the last of his PDQB discoveries), he just writes whatever pops into his head. He has also been known to write music as gifts or as compensation for a favor, which was the genesis of several of the works played Sunday. The first work, Music for Mary (1990), was just such an item, a gift for an artist friend who had done an album cover (no, not that kind of cover artist). This brief suite (almost all the pieces are brief, some gnomically so), originally for recorder and piano but rescored for flute, has an opening movement that alternates ethereal passages in thirds with busy scalar motifs (rather similar, in fact, to a theme attributed once to Arcangelo Spumoni); a second movement in which the scalar motifs are inverted, and a third that returns to the thirds motif and a rhythmic alteration of the scalar one, then bringing back the thirds in a more dappled harmonic setting. Foreman and Baksys brought off this Satie-esque utterance with poise and purity. Dream Dances, from 1988, also began as a thank-you to a copyist with the Grand Rapids Symphony (hold that thought), which Schickele expanded from a single movement to a five-movement suite for flute, oboe and cello (Foreman, Sheena, Déjardin) mixing 18th century dance styles—minuet, galop, sarabande—with a 19th century waltz and a very 20th century jitterbug. The opening minuet was over nearly before it started, followed by the jitterbug of persuasive authenticity, using the same motivic materials as the minuet (maybe this followed through the whole suite, but it was less evident later on). The waltz, a slightly jazzy “not so grand, not so rapid” American version of the dance somewhat reminiscent of Virgil Thomson’s works in this vein, contained some white-key dissonance and the odd blue note. The galop, which begins with the characteristic double-short-long rhythm, also develops some bluesy bends, and has a middle section oddly invoking the orientalism of Scheherazade. The closing sarabande was probably the most original and striking movement, not only because it’s unusual to end a suite with a slow movement, but because this sarabande was straight out of the Great Plains, with Harris’s sincerity and none of Copland’s city-slicker imitation. The oboe and cello carried most of the burden for continuity, while the flute provided gracious arabesques and subtly shifting accents. The first half closed with After Hearing Bach (2007), for oboe, violin, viola and cello in which the composer implicitly answered a question he said his brother had once put to him, “Why don’t you write a PDQ Bach piece that isn’t funny?” There are some obvious cues for several of the five movements: an opening allegro that springs from the world of the Brandenburg Concertos, an energetic third-movement fugue, and a finale that Schickele acknowledged was more like Johann Christian Bach than Johann Sebastian. There are two slow movements, a very short second with some American flavor, and a more fully-realized fourth that is chromatically and harmonically more restless. The work as a whole left a feeling of being a compositional exercise rather than a real filtering of Bachian thought through Schickele’s own idiom; a real Bachianas Norte-Americanas would have been more enticing. Sheena, Putnam, Basrak and Déjardin were diligent, energetic and clear-voiced, though the dynamic levels seemed to have been set way down (does Schickele not write anything louder than mezzoforte?). Two early works began the second half, beginning with Summer Trio from 1966 for flute, cello and piano. This very ingratiating piece is both harmonically richer and structurally fuller than most of the others on the program, and is worth seeking out by performers looking to supplement, say, the Weber flute trio. The second movement bebop features some nice solo writing for cello, which Déjardin rendered gleefully. The third movement, subtitled “Glimpses,” is enigmatic and, like the opening of Music for Mary, offers contrasts between serenity and gruffness. The finale, another slow and gentle ending, evokes a static Georgia O’Keeffe feeling (the piece was written on a holiday in Arizona), with the stately decorum of Satie and Hovhaness. Gardens, also from the late 1960s, for oboe and piano, consists of three miniatures in a morning-noon-night sequence, the first with a warbling oboe line against shrill birdcalls in the piano’s upper register, the second a more convoluted interplay of interlocking rhythms, and the last with the two piano lines operating in distinct ways—a steady thrum in the left hand, rhythmic irregularity in the right—with the oboe floating above them. Sheena’s variegated colors were memorable. The closer, a 2008 commission from An die Musik, retold Hans Christian Andersen’s The Emperor’s New Clothes with a freely adapted narration presumably by the composer (who read it at the performance). In 12 short sections of music, Schickele tries to outdo Prokofiev’s Peter and the Wolf. Not only does he give each person (and sometimes thing) its own characteristic tune (we loved the glittery bits for the emperor’s magic mirror—yes, liberally borrowing from a different fairy tale), but he also arranges them so that they go with each other. Thus, the vainglorious emperor consorts with his boogie-woogie dog, and perhaps most effectively, he gives each of the four members of the family of tailors a distinct personality—take that, Elliott Carter! It’s all witty, charming, clever, and fun. Sheena, Putnam, Basrak, Déjardin and Baksys performed with frolicsome energy, and Schickele’s narration channeled the occasional mock-innocent archness of Stan Freberg. If Schickele had never invented PDQ Bach, works like this would have earned him at least a minor niche in the edifice of the musical pantheon. And if I am not mistaken, the Professor’s actual specialty at USND@H is musicolology (or musical pathology). So it was sold out and I would have been turned away; I was lucky. That composer mentioned in this review, Spumoni, sounds icily Italian, not familiar with him–his reputation must have melted away. Properly, “research” into P. D. Q. Bach is commissioned, costs money to discover things like the real gem Oedipus Tex or the 1712 Overture (which demands to exist: you will never hear the 1812 the same way). Would like to hear sometime how he came to come up with P D G–which is a thinkly disguised parody of a lot of “modern” music; think of the Hardart as a satire on synthesizers. Of course it is also a parody of academic “production” (the missing Marxist dimension to Chopin’s Etudes, etc.). I’m not sure where Nathan was going with this, but if he had shown up for this “sold out” concert he would not have been turned away. The truth is that any “sold out” concert will have a few seats available, as long as you’re not picky about having two together or in the best location or the cheapest. I went to a concert of the Portland Symphony a few weeks ago and was told it was sold out; but had no problem getting a ticket.